Lively like a roving Scotsman, The Shetland Sheepdog (Sheltie) is a miniature version of a Collie that originated on the small but rugged Shetland Islands northeast of Great Britain. The Sheltie’s history is a little fuzzy, but it could possibly be traced back to the Rough Collie of Scotland. The Sheltie was probably created by crossbreeding the original Sheltie – similar to the larger Icelandic Sheepdog – with small, intelligent, long haired breeds. The Sheltie was a working dog, used to protect homes and herd livestock. The breed was first registered in the United States all the way back in 1911, and today the Sheltie is among the top 20 dog breeds in America. 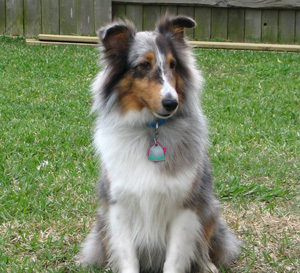 Lively and extremely intelligent, the Sheltie constantly amazes with his speed and ability to learn tricks. He excels in games of agility, but he can also play fetch for hours and hours. He’s also known for the “Sheltie spin” because when he gets excited, he’ll jump and spin wildly like a top! The Sheltie is a great breed for active families, and he’s the ideal companion for walking, running, and hiking. He’s also brilliant: considered the 6th most intelligent dog breed, he’s highly trainable and eager to please. Importantly, the Sheltie gets along well with children, other dogs, and cats. The Sheltie is a barker. At the sight of a strange dog or person, the Sheltie will spin like a top and bark like mad. While this was once considered a positive trait because it helped stave off livestock thieves and danger, it can be pretty annoying to live with. The Sheltie’s natural herding instinct is strong: he’ll chase squirrels, joggers, cars, and even the occasional mailman. To keep a Sheltie under control – and out of dangerous situations – it’s important to start training early and stick with it. Exercise! As we like to say, a tired dog is a good dog. The Sheltie needs a lot of exercise (both physical and mental), but it’s worth it to keep him well-behaved. The Sheltie has a double coat, so he needs regular brushing to avoid matting and tangling. Also, professional grooming every 5 or 6 weeks is a good idea, especially in the fall when Shelties shed the most. When trained well and exercised thoroughly, the Shetland Sheepdog can be a great companion for the right person or family.